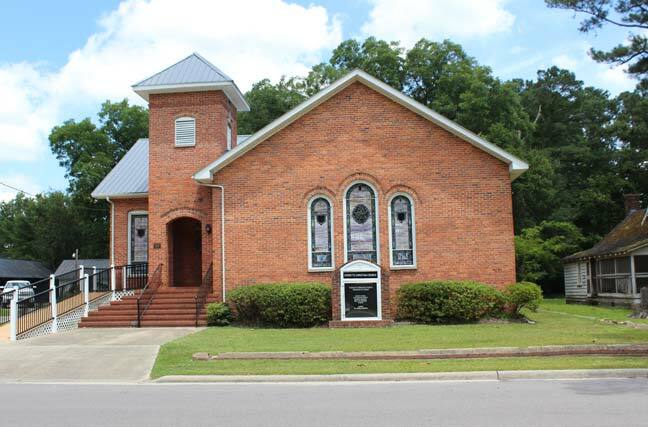 The Everetts Christian Church was chartered with 78 members on Sunday, July 3, 1921. Revivals in the area had been being held on the second floor of the Champion Auto Building, later to become the Zimba Cola Bottling Company. The first services after the charter for the new congregation were preached by Rev. James M. Perry of Robersonville. Then in 1922, Charles B. Roebuck and other men in the community went into the woods and cut the timbers for the new church building. 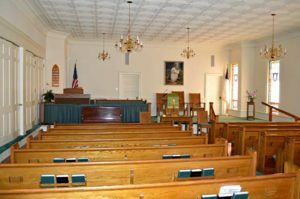 When the church was built, there was no electricity so the church used a Delco generator. On the 3rd Sunday in September, 1922, the first recorded church conference was held and the roll was called with 88 members attending and 30 absent. A vote was taken for a pastor for the year and Brother L.A. Mayo was unanimously elected. Dedication of the building was on the third Sunday in November, 1923, with preaching by J.A. Taylor and L.A. Mayo. The service was followed by dinner on the grounds. Everetts Christian Church is a one-story, brick-veneered, Romanesque Revival style building with a front-gable façade dominated by three arched stained-glass windows capped with corbelled brick hoods. The church is a product of the movement to incorporate popular national architectural styles into North Carolina churches during the first decades of the twentieth century. Everetts Christian Church is still functioning as an active church with regular services.